A million years ago I was driving through Aldershot when I was confronted by a Gurkha, standing in the road staring intently at a map. I hovered there for a bit in my little Nissan and after a short time he returned to the here and now and gave me a look of surprise and a broad grin before sauntering off towards the Wellington monument. This remains my only contact with a Gurkha doing any soldiering. It is probably difficult for people outside the UK to appreciate how revered the Gurkhas are in my country. You hear all that stuff about loyalty and steadfastness or the lofty and out-dated racially superior description of them as ‘doughty little fighters’ etc. But even as times and attitudes have changed and the British army has shrunk to alarmingly low manpower levels, the Gurkhas retain something mythical and wholly exceptional about themselves. I had the honour of meeting Lachhiman Gurung, VC, a year or so before he passed away and when I say ‘met’ I mean more like presented to than anything else. He never spoke and sat looking at the gathering of numpties gawping at him with the world-weary look he had perfected and I can tell you that despite his fragility he had a dignity I hope I have when I am an older me. The truth is there is also something to admire about the Europeans who served with the Gurkhas. Just last year I had a week in Gallipoli with Peter Hart and my mates and with us was a former Gurkha officer who amazed us with his incredible knowledge and a gazelle-like ability to get about. One morning we were staggering through the overgrown Krithia Nullah and he shredded a path for us with a big stick as if it was nothing. Later in Gully Ravine he seemed to glide over quite treacherous terrain and it was obvious he had lost none of the experience he had gained as a soldier. It was impressive. Last week at the War & Peace Revival some of the unpleasant and demanding jobs were done by a team of former Gurkha soldiers and they were the business. Some of them looked terrifying and this, of course, is where my point about myths comes in. For these guys were so composed and calm it was totally at odds with the image of kukri flashing killers beloved by the tabloids. This sort if stuff is meat and drink to this fantastic book by Craig Lawrence that is essentially a bit of a love story for his regiment and for all Gurkhas. Books like this are impossible to dislike. They come along from time to time and wash over us and I suppose, if I am honest, they sit on the bookshelf for occasional visits during my quieter moments. I love a great narrative, but the added appeal here is what it brings to rainy days and holidays when I need to fill a bit of time. I don’t watch a lot of telly, so I rely on this sort of book to keep me sane. 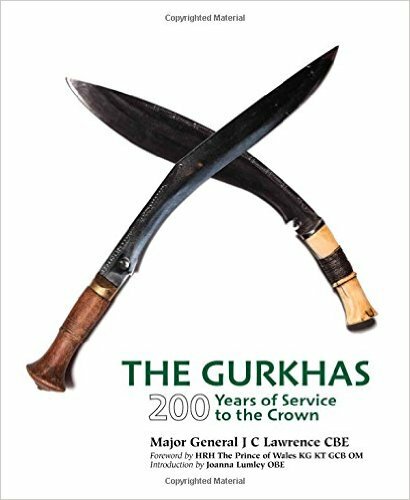 The book recounts the fairly well known fact that having fought them and been hammered, the British were so in awe they added the Gurkhas to their arsenal. The Gurkhas have served everywhere from the North-West Frontier to Flanders and Alamein, to Burma and Borneo and on to the modern wars we have known in recent decades. They have been winning plaudits, honour and glory ever since. But, make no mistake – they are not mercenaries. 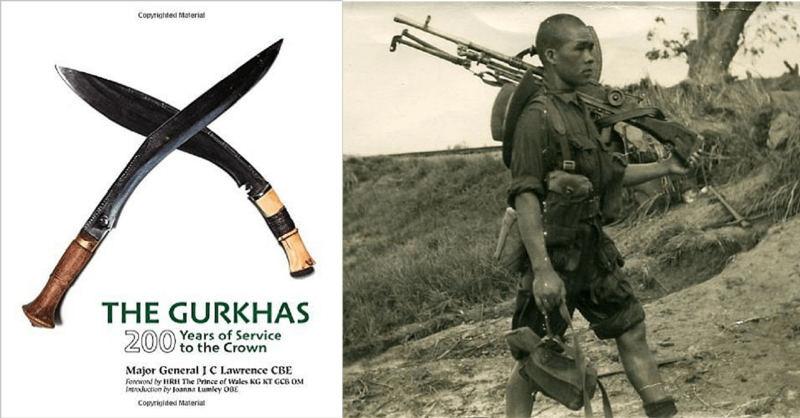 Despite being a senior soldier, the author does not shy away from recent anger over the rights and conditions of former Gurkha soldiers and their families, especially those hoping to reside in the UK. The role of the actress Joanna Lumley, the daughter of a Gurkha officer, as a spokesperson and campaigner is recognised and it is admirable given the extent of political correctness these days that she has written a forward. Right is right and I have no truck with any kind of discrimination, so having a balanced history that covers such a delicate issue makes this book all the more commendable. If anything, the clearly favourable bias of such a devoted author adds something others might not have brought to the table. Two centuries of history and a friendship it is impossible for me to to define fly by in over two hundred large format pages. This is one of those paving slab size books you cannot ignore. So don’t!